Ong Choi (Ipomoea aquatica), is a member of the Morning Glory family (Convolvulaceae). The most common varieties are bright green and grow up to 14 inches tall. Ong Choi is of East Indian origin and is extremely popular in Southern China, Vietnam, Malaysia and Thailand. The name Ong choi in Chinese literally translates as "hollow vegetable", and although it is closely related to sweet potato (Ipomea batatas) and convolvulus, it has no relationship with the common spinach. Morning Glory, Water Spinach, Kankun, Kong Xin Cai (Kong Shin Tsai), Chau Gan Choi, Rau Muon, and Swamp Cabbage. 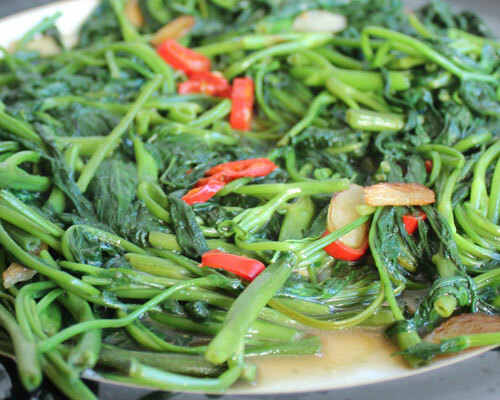 Lightly boil, steam, stir-fry with shrimp paste, combined with other greens and used in soups. Ong Choi deteriorates rapidly once picked, so ideally it must always be used very fresh. The leaves can be used whole, or cut into smaller pieces and like ordinary spinach, the stems require slightly longer cooking than the leaves. 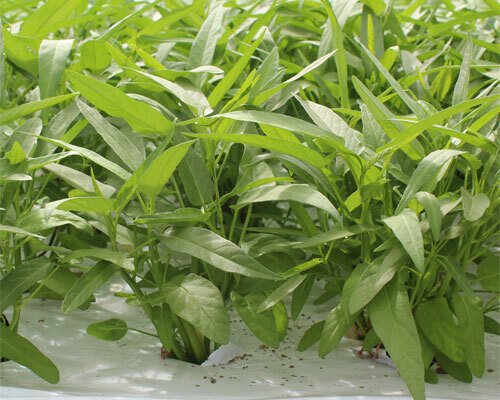 Almost all parts of the young plant are eaten, although the shoot tips and younger leaves are preferred. 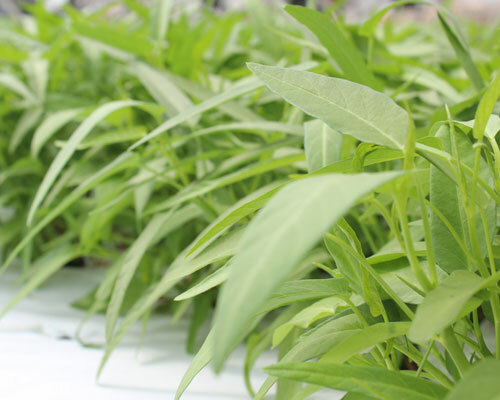 Older stems that are from plants cultivated on dry land, contain considerable fiber and therefore the cultural methods emphasize the production of young succulent tips. The Cantonese exclusively stir-fry it, with a generous amount of garlic (or garlic shallots) and either white fermented bean curd or fermented shrimp sauce; chilli is commonly added.